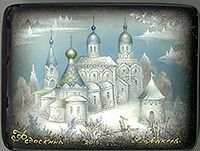 This beautiful view of the Kirillo-Belozersky Monastery (or "The Monastery of St. Cyril") has been painted by Alexander Mikheev. The Monastery was founded in 1397 on the bank of the Siverskoe Lake, to the south from the town of Beloozero, in the present-day Vologda region. Its founder, St. Kiril, descended from one of the most distinguished boyar families Veliaminoff. In the 16th century, the monastery was the second richest landowner in Russia, after the Troitse-Sergieva Lavra. Ivan the Terrible not only had his own cell in the cloister, but also planned to take monastic vows here. The composition is filled with a variety of details. The box's sides are adorned with the silver dot pattern . The box is constructed from paper-mache. Black lacquer is used to paint the exterior of the box while red lacquer completes the interior of the work. The lid is hinged from the top of the scene, and the box rests on four little round legs. The work is signed with the artist's name, Fedoskino and the year of 2016.